Those who suffer from various physiological or neurological problems that come with balance issues often can benefit from using a walker. Walkers for balance aid everyone from those recovering from joint surgery to those who have a chronic debilitating neurological disorder that affects balance. A standard walker is a freestanding mobility aid that offers a support structure to lean on that easily moves forward as the person ambulates. Walkers are made of sturdy tubing and have four legs held together in a frame. Cushioned grips are in place for the hands. Walkers are height adjustable. Some have wheels attached to the ends of front legs. Some models have small skids on the back legs made of a durable polymer that easily glide over thresholds in doorways and areas where floor surfaces change. Bariatric walkers are made sturdier than standard walkers, making them capable of supporting people who are much heavier. Some support bariatric patients that weigh up to 1000 pounds. 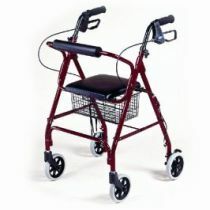 Standard walkers are usually made of an aluminum tubing only rated to support users of normal weight. Walkers for balance aid people in being mobile in their environments. Mobility encourages self-sufficiency. Some with handicaps need just a small assist with balance as well as having instant access to a place to sit and rest. Rolling walkers come in models made for both normal weight and bariatric patients. They have four wheels with a hand brake as well as an integrated seat. There are rolling walker models that support people that weigh up to 500 pounds. Walkers come with many accessories that can be easily added on for your extra convenience. The standard hospital walker has four legs with rubber tips. A person lifts the lightweight walker, moves it forward a bit and uses it to take a step forward. Rolling walkers have four wheels to move with each step. Hand brakes stop the forward motion when the walker is used for support during a step forward. Front wheel models that have rear skids are used by people who need a standard walker but cannot lift and step. The walker slides with each step. Baskets are another accessory that rounds out a walker’s usefulness in transporting small items. An integrated seat is only available on specialty walkers such as roller models. A standard walker or bariatric model can be found new for under $100.00. Roller models can go as high as $500.00 or more. Accessories add to the cost. Maintenance costs involve regular replacement of leg tips, wheels and skids. Skids can wear out fast when walkers are used on concrete and pavement since they are designed to slide over surfaces. Walkers for balance aid in recovery, rehabilitation and encouraging mobility in all who have a difficult time with maintaining balance. Whether a walker is used for a short term to recover from an acute condition such as surgery or for use by those who need a lifelong assistance with balance, there is a walker model for every need.